I admire greatly Duncan’s use of the canvas of the page, allowing the line breaks and indentations to make the poem come alive. The speaker’s voice is made more hushed, and alternately roars and reverberates through Duncan’s use of white space, her control in architecting a poem as she intends us to read it, hear it, and sit with it. She builds this poem without the use of punctuation, although this occurred to me only on my second reading. We are ensconced in the stanzas as is the speaker when she is “…/ pulled into the rhino / nestled in its crib of ribs / reminded of what I’ve missed // the deckled skin / of home” (10). 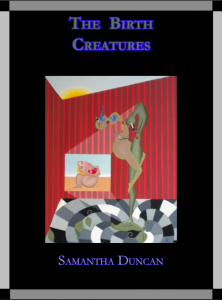 The Birth Creatures brought back to me, viscerally, the first three months following the birth of my two children. “revolution/ is the gist of it”(10), Duncan writes and it’s true. The Birth Creatures reveals how anticipating and actually living the reality of motherhood are two distinctly different entities. The baby arrives and all landscapes (temporal, physical, emotional and mental geographies) are violently transformed and known, trusted systems are overthrown. And yet, in finding our way through unmapped terrain, Duncan reveals there is magic all around us. In the home she’s created there is room enough for a rhino, a cypress tree, and even the moon. There is room for readers to reflect, room for remembering and reinventing, as we come to know the terrible wonder, wilderness, and beauty of laboring new life into being, ourselves included. Barbara Harroun is an Assistant Professor at Western Illinois University. Her most recent work is forthcoming or appearing in Fiction Southeast, Watershed Review, Rappahannock Review, and Iron Horse Literary Review. Her favorite creative endeavors are her awesome kids, Annaleigh and Jack. When she isn’t writing, reading, or teaching, she can be found walking her beloved dog, Banjo, or engaging in literacy activism and radical optimism. She can be found at barbaraharroun.com.